Posted by BaBa under: Geek Stuff - Technology; Photography; Retrospect; Special Days . The picture represents Sheridan’s Story. Click Here to go to the post about the inspiration of his pictorial story. 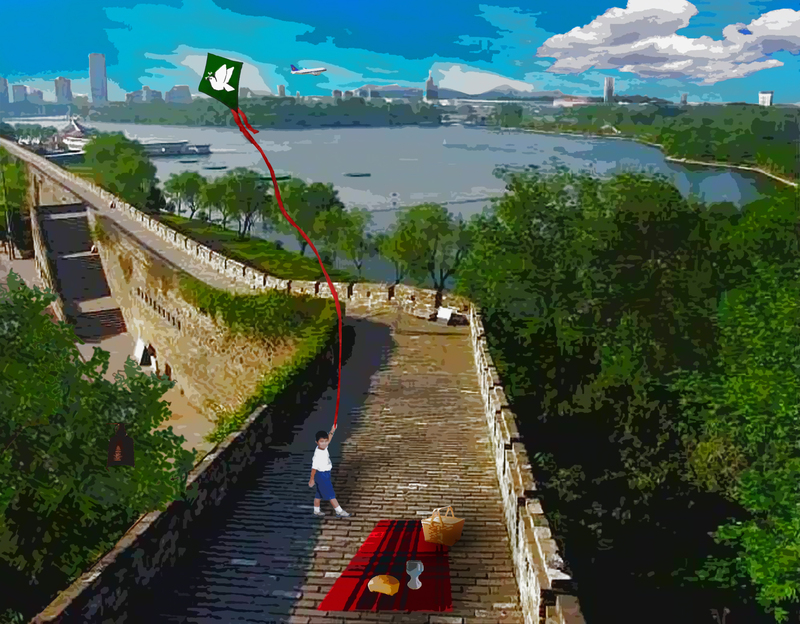 The picture is the Nanjing City wall overlooking Turtle Lake (Xuanwu Lake). Across the lake from the wall is the Nanjing Train Station where Sheridan was found. We were on this wall looking over the lake toward the train station on July 12, 2006. 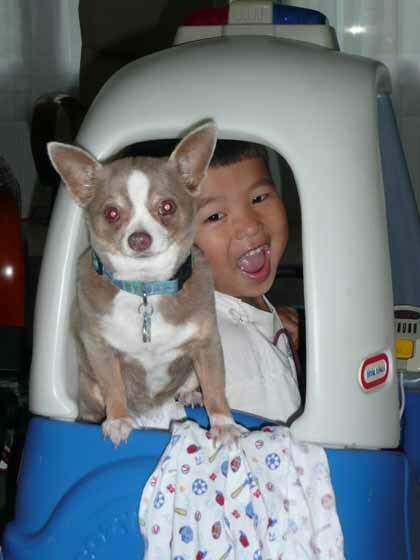 What is significant is this is also the date of the first photograph that we have of Sheridan taken by another adoptive parent and posted in the Yahoo group for the Nanjing City Welfare Institute. It is one more item that some would pass as a coincidence, but I recognize as a sign. This is the view of the wall we choose for his story. On the left side, we grew some trees to cover the parking lot. On the wall, we added The Family Tartan with it’s threads of read and green. Since the tartan is shown as a blanket on the wall, we added a picnic basket along with a loaf and chalice. The bread and chalice symbolizes the role of God in our lives and the guiding hand in our journey. Sheridan was added to the photo from a shot I took with him holding a balloon photographed from the same perspective. We deleted the balloon and added a kite. The kite and dove are symbols important in understanding his name.. The view from the wall overlooks the lake and shows the city beyond. Behind the city are large fluffy white clouds floating freely in the sky which are again symbols in his name. A plane in the sky represents our journey to be united with Sheridan. Finally on the tree in the lower left of the picture, is one of the Wuhan Bells. This bell is one from the Wuhan Bronze Bells that were unearthed from the tomb of Yi (the king of the Zeng Sate in the Warring States Period (476 BC – 221 BC). 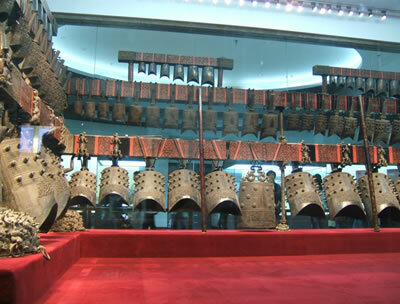 The most famous treasure from the tomb is the Chime Bells, which is the largest bronze musical instrument ever discovered. With a set of bells of different sizes, it can play various tones of the musical scale, and the timbre is quite beautiful. 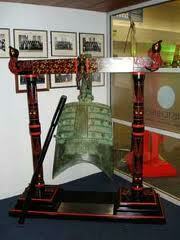 There are about 3,000 ancient Chinese characters on the bells, describing the music and the owner of this instrument. We were in Wuhan at The Hubei Provincial Museum when we heard the bells ring. It was in this museum, where we met adoptive families who had just been united with their children. In this museum, MaMa and I each talked to new parents separately about their experiences and the process. It also turned out that these families were with the agency we used in our adoption.